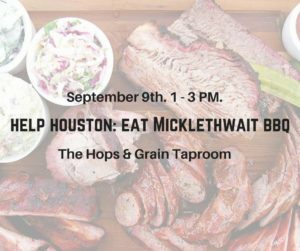 We’re partnering with Michlethwait Craft Meats to support our neighbors in the Houston area. Join us and enjoy their tasty BBQ (vegetarian and vegan options available), as 100% of sales from the BBQ fundraiser will be donated to support the Hurricane Harvey Relief efforts through Shinyribs (Kevin Russell’s) YouCaring.com fundraiser benefitting the Golden Triangle. Can’t make the event, but want to help? You can donate now RIGHT HERE!